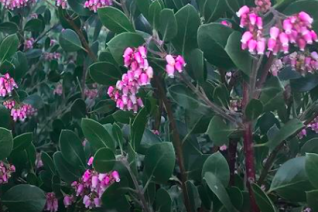 Our very, very favorite Manzanita and one of the very rare ones in the wild. Occurs on two ridges in northern California- Horse Mountain was one of them and Greg’s dad just happened to have a cabin there. 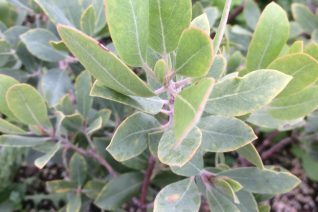 Low, dense, spreading, very gray shrub to 3′ x 5′ wide in time. 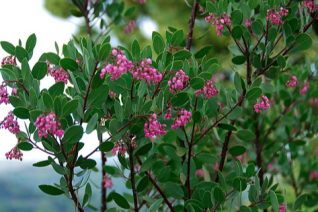 The bark is a great glossy mahogany and the winter/spring flowers are white tinted pink. 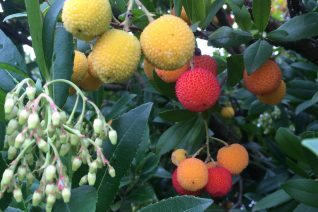 Russet berries are quickly consumed by wild life. 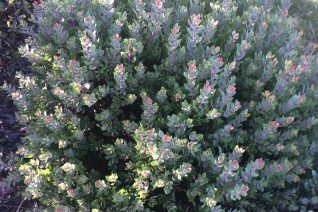 Spectacular shrub for full sun, average to poor, well-drained soil and absolutely no summer water. Loathes the combination of water and heat. Neglect is its friend and you will reap great rewards with this beautiful shrub by strictly ignoring it once it is established. 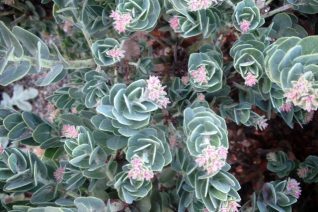 Ultra cold hardy- hailing from over 4500′ in elevation and recommended for cold gardens. 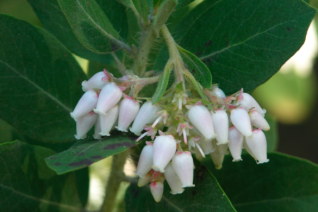 This species is native to southern Oregon, and though not technically native to Oregon this is our favorite form of this species. Not the easiest to propagate so quantities are often limited. Absolutely NO summer water. Ever. Forms rounded balls of soft silver. Dynamic on slopes. 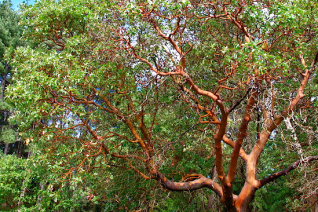 Our native Hairy Manzanita is one of the most widespread species in the PNW. Unfortunately, its not the most reliable and can be kind of hard to grow. It will grow happily for years and then suddenly decline. No explanation.This can be avoided by strictly avoiding all irrigation once established. 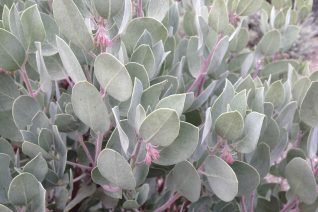 Large-growing shrub with gray green leaves, the telltale hairy leaf petioles and white flowers in spring. 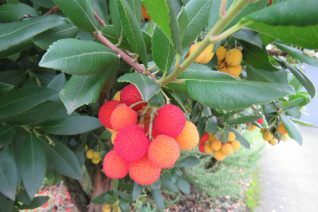 Russet berries follow. Its best attribute is its smooth exfoliating mahogany bark. And in time you can remove the tired lower branches to reveal it as well as improve air circulation. To 8′ x 8′ very quickly in average, well-drained soil. No summer water and little intervention from the gardener. Wild areas, dry hillsides. This form we selected from the southern Willamette Valley. It occurs in specific sites around the Valley and is common at the coast /coast range as well as the Cascades. During the warm interstadial (4000-8000 yr BP) when our climate was considerably milder with a much more pronounced summer drought it was much more widespread- once found in the city limits of Portland at two sites those have been usurped by development. Excellent performance in hot dry urban sites. Oregon native plant.